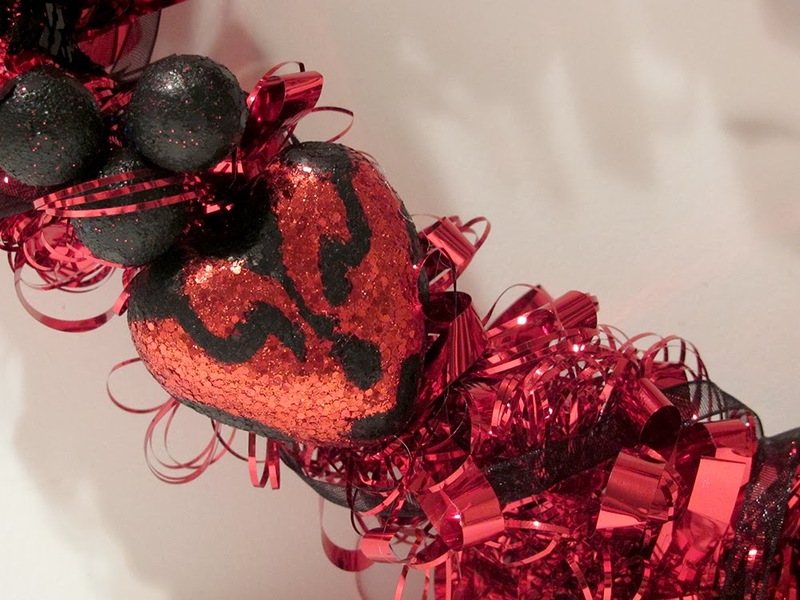 Nothing says Valentine's Day like a sparkly Sith, am I right? 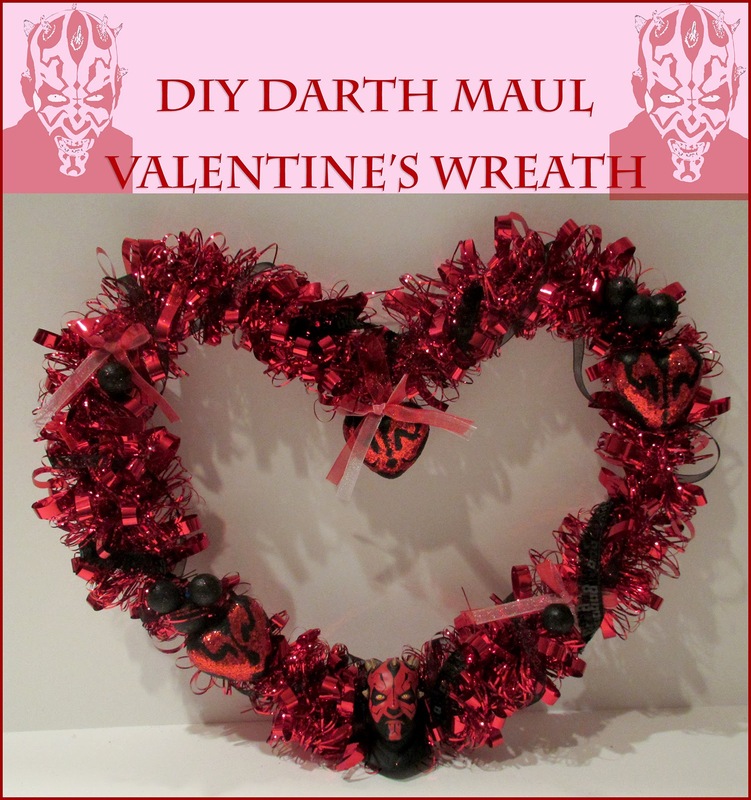 When I was considering Star Wars-themed Valentine craft projects, Darth Maul immediately came to mind. One: I find Maul to be incredibly attractive (I said it) and two: red is a good color for the holiday and he fits the bill. I wasn't sure I could pull it off until I found glittery red heart ornaments in the craft store that were perfect Sith material. Tada! I think it has just the right touch of flair and tackiness. Part of me is hoping it will scare the next delivery man who knocks on my door. After you've got everything in one place, do your painting first so you can set everything aside to dry while you work on the wreath. 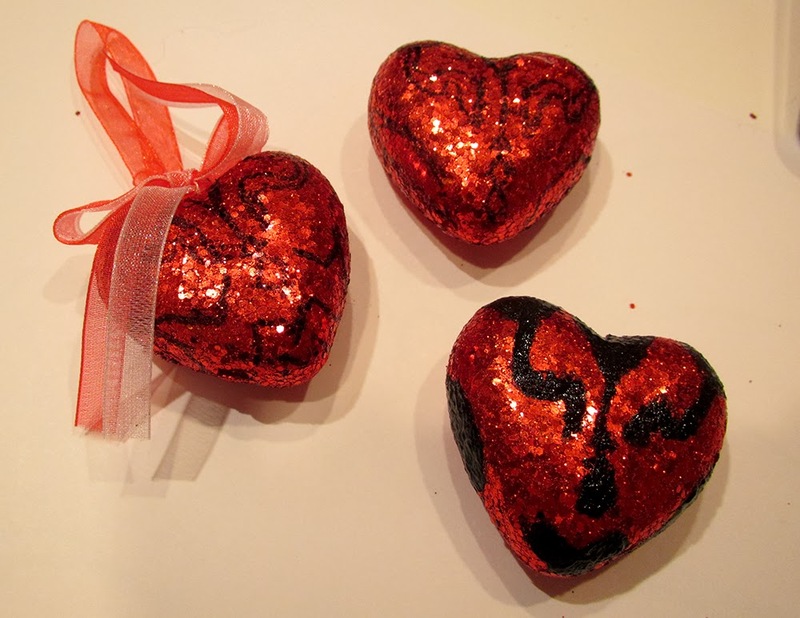 I decided to paint the hearts with the pattern of Maul's tattoos. 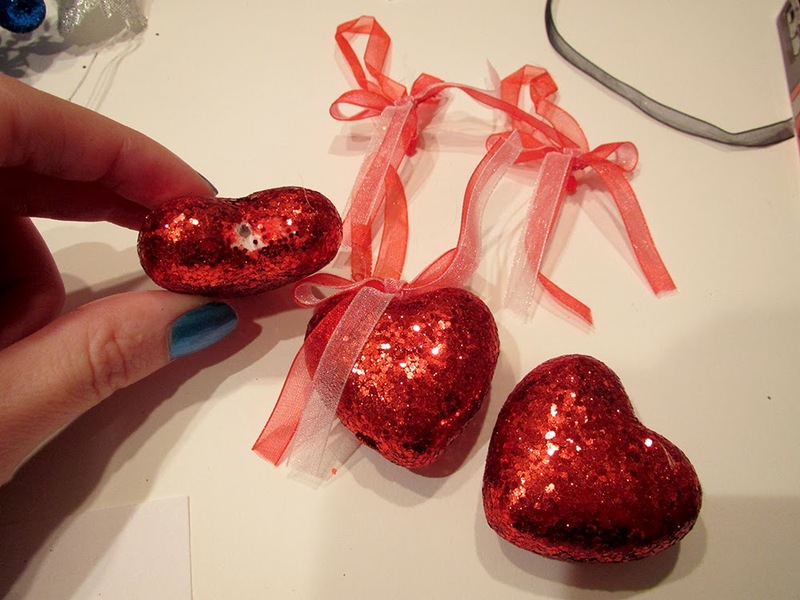 I pulled the bows out of the top of two of the glittery hearts; as you can see above, it leaves a hole but we'll paint over it and it's hard to see the tops of the hearts anyway. 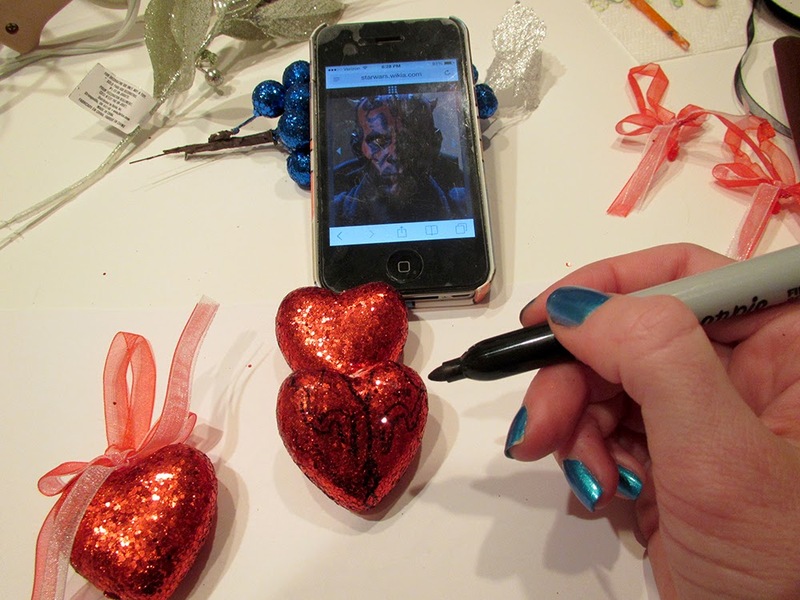 Pull up a reference photo of Darth Maul and outline the tattoos on all the hearts you want to use with a Sharpie. It doesn't have to be exact, just close enough to convey the idea. After they're outlined, fill the tattoos in with black acrylic paint and set them aside to dry. Now for additional wreath adornments. Given that Halloween was a while ago, I couldn't find any existing black embellishments for wreaths. 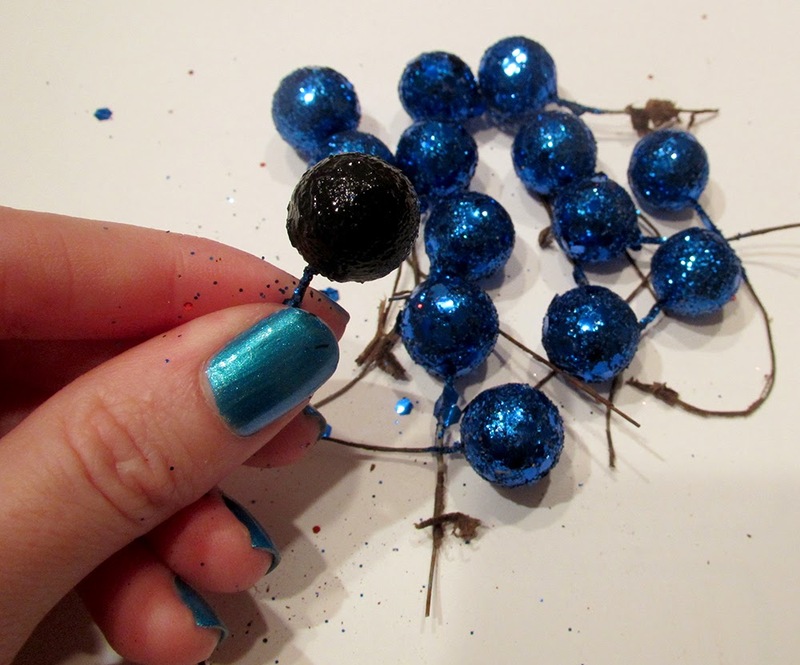 Luckily, I had lots of extra balls (yeah, blue balls, I know) and leaves and stuff left over from making my R2-D2 wreath so I just decided to paint some of them black. Since it's a small wreath and I already had the hearts to take up real estate, I just needed a few touches. 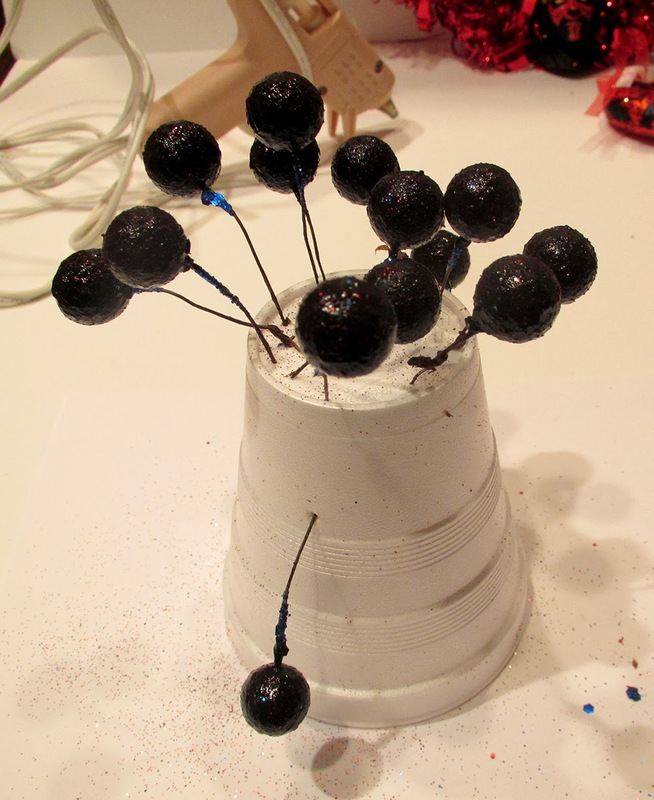 I split the balls from the bunch you see in the supplies photo, painted them with a single coat of black paint, stuck them in a styrofoam cup to dry, and sprinkled red glitter on top of them. Maul likes a lot of glitter. I ended up going back later to add some black sequin ribbon I had left over from my Padmé costume over three years ago. Look! I've just rationalized keeping everything forever. For the ribbon - both kinds - I just tied the end around a loop of the wreath and secured it with a drop of hot glue. I wound it around loosely and knotted and glued the opposite end. You could glue in select spots along the way, I just like my riboon loose like I like my... never mind. Next, embellish away until you're happy. There's no wrong way to do it. 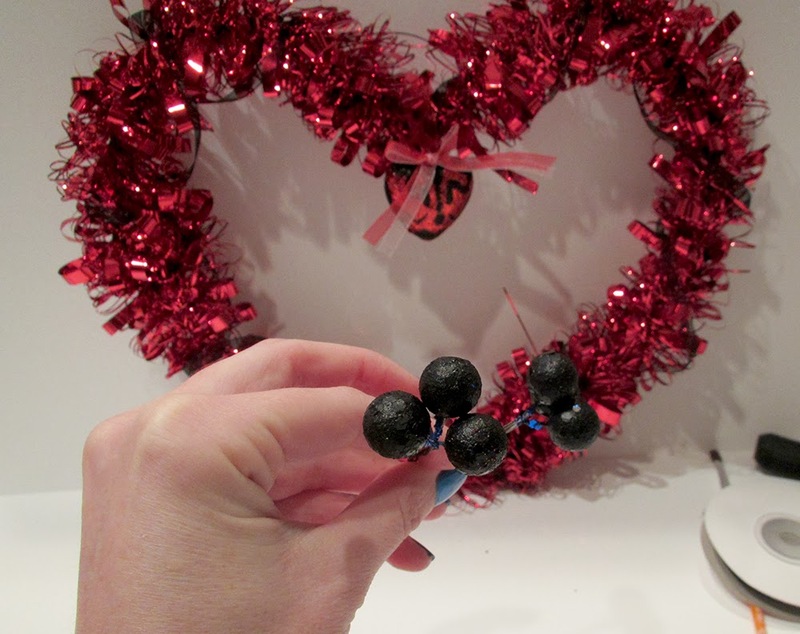 I twisted three of the balls together to form little clusters - I made two clusters - and then wound them around the wreath and secured them with glue. 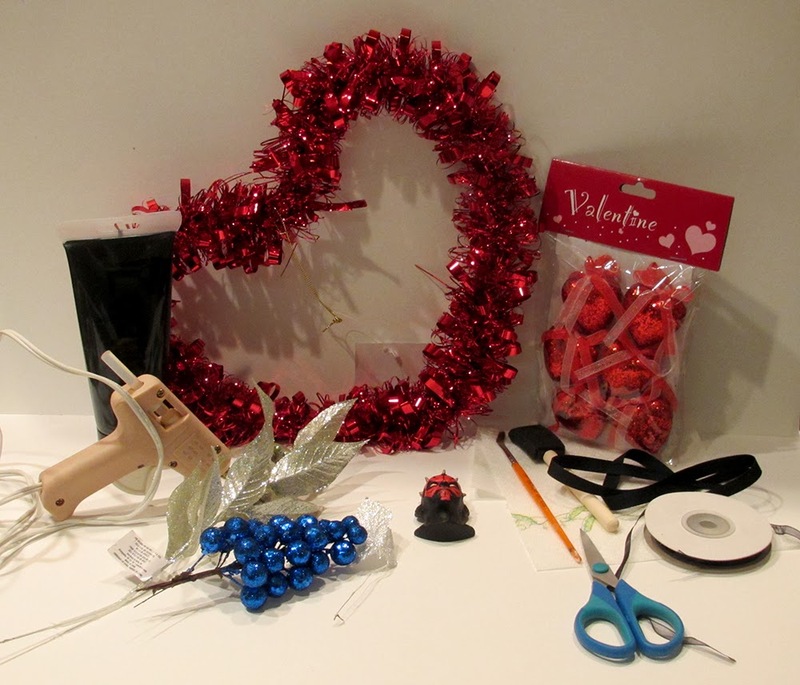 I glued the backs of two foam hearts and put them on the wreath, and I glued the top of the heart that still had its bow to the middle of the wreath so it dangles. 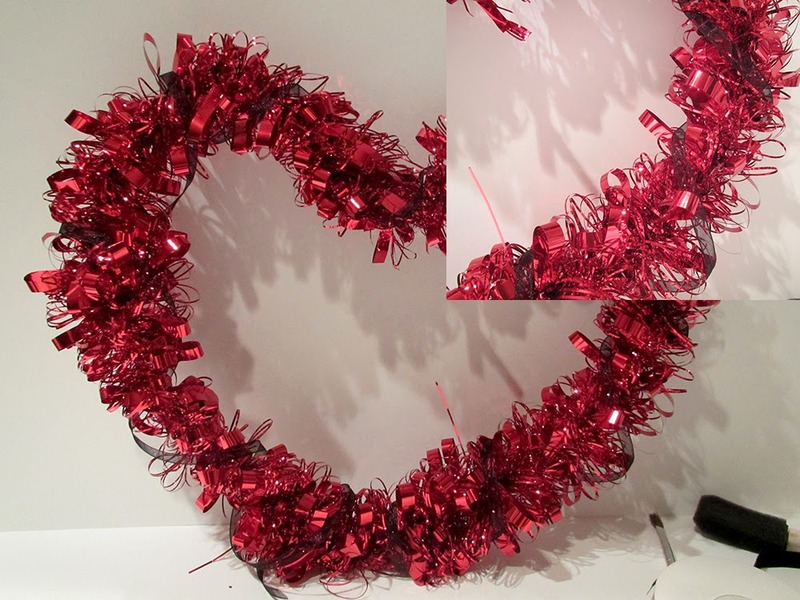 And remember those bows we ripped out of the glittery hearts earlier? I used those, too. Even though the wreath has some Maul touches, I thought it needed the face of the Sith to make the circle complete. 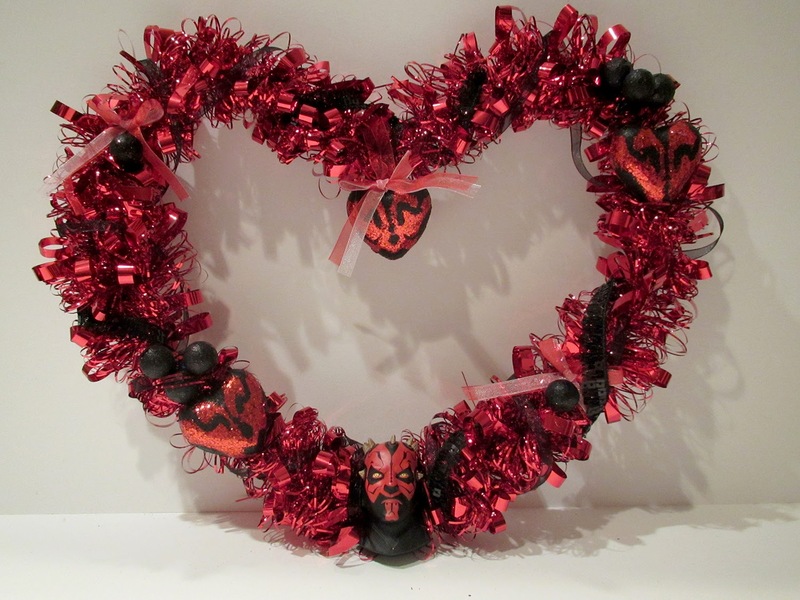 I had a Darth Maul magnet that was just right so I attached him with hot glue to the bottom of the wreath (maybe I pretended it was like Anakin's lava experience on Mustafar). If you don't have a magnet, you can use a LEGO minfig, an action figure, a picture of Darth Maul on Shrinky Dink plastic, an image of Darth Maul you print from the internet and then cut and attach to foam core... you get the idea. There are plenty of options. You could even just go with a red and black bow. Darth Maul, you have my heart. "Maul likes a lot of glitter." Oh thank goodness. I would hate to have to change my style to impress him! By the way, I really love your holiday wreaths. I'm going to have to start making things like that once I finally get my home in shape! Yes! Forgiving is just what you want when you've been working hard and you can't spend too much time on crafts.